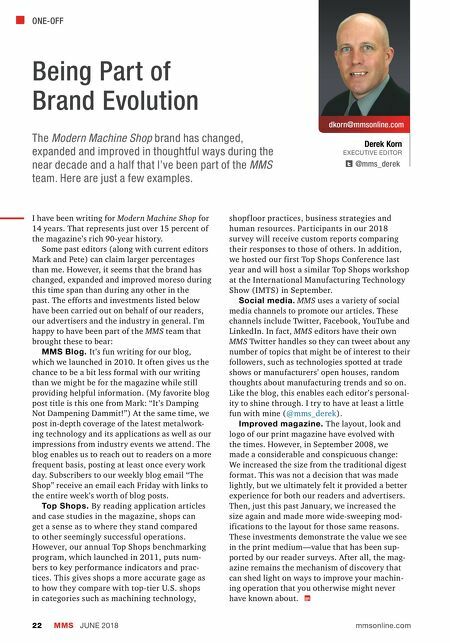 ONE-OFF MMS JUNE 2018 22 mmsonline.com dkorn@mmsonline.com Derek Korn EXECUTIVE EDITOR @mms_derek Being Part of Brand Evolution The Modern Machine Shop brand has changed, expanded and improved in thoughtful ways during the near decade and a half that I've been part of the MMS team. Here are just a few examples. 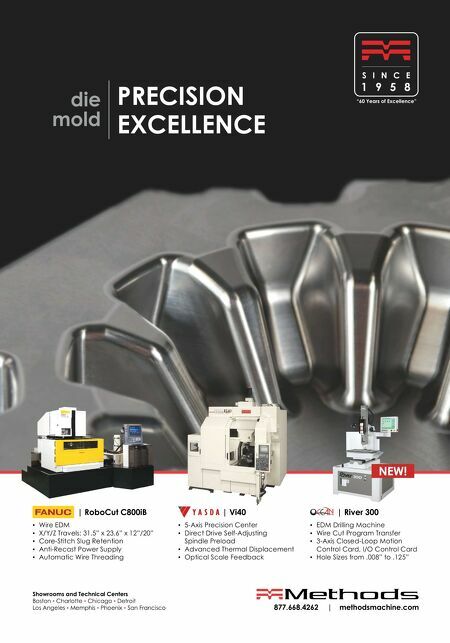 I have been writing for Modern Machine Shop for 14 years. That represents just over 15 percent of the magazine's rich 90-year history. Some past editors (along with current editors Mark and Pete) can claim larger percentages than me. However, it seems that the brand has changed, expanded and improved moreso during this time span than during any other in the past. The efforts and investments listed below have been carried out on behalf of our readers, our advertisers and the industry in general. I'm happy to have been part of the MMS team that brought these to bear: MMS Blog. It's fun writing for our blog, which we launched in 2010. It often gives us the chance to be a bit less formal with our writing than we might be for the magazine while still providing helpful information. (My favorite blog post title is this one from Mark: "It's Damping Not Dampening Dammit!") At the same time, we post in-depth coverage of the latest metalwork- ing technology and its applications as well as our impressions from industry events we attend. The blog enables us to reach out to readers on a more frequent basis, posting at least once every work day. Subscribers to our weekly blog email "The Shop" receive an email each Friday with links to the entire week's worth of blog posts. Top Shops. By reading application articles and case studies in the magazine, shops can get a sense as to where they stand compared to other seemingly successful operations. However, our annual Top Shops benchmarking program, which launched in 2011, puts num- bers to key performance indicators and prac- tices. This gives shops a more accurate gage as to how they compare with top-tier U.S. shops in categories such as machining technology, shopf loor practices, business strategies and human resources. Participants in our 2018 sur vey will receive custom reports comparing their responses to those of others. In addition, we hosted our first Top Shops Conference last year and will host a similar Top Shops workshop at the International Manufacturing Technology Show (IMTS) in September. Social media. MMS uses a variety of social media channels to promote our articles. These channels include Twitter, Facebook, YouTube and LinkedIn. In fact, MMS editors have their own MMS Twitter handles so they can tweet about any number of topics that might be of interest to their followers, such as technologies spotted at trade shows or manufacturers' open houses, random thoughts about manufacturing trends and so on. Like the blog, this enables each editor's personal- ity to shine through. I try to have at least a little fun with mine ( @mms_derek ). Improved magazine. The layout, look and logo of our print magazine have evolved with the times. However, in September 2008, we made a considerable and conspicuous change: We increased the size from the traditional digest format. This was not a decision that was made lightly, but we ultimately felt it provided a better experience for both our readers and advertisers. Then, just this past January, we increased the size again and made more wide-sweeping mod- ifications to the layout for those same reasons. These investments demonstrate the value we see in the print medium—value that has been sup- ported by our reader surveys. After all, the mag- azine remains the mechanism of discovery that can shed light on ways to improve your machin- ing operation that you otherwise might never have known about.